I think that it’s pretty misleading to have a movie called “Funny People” and that stars Adam Sandler. Not a fan of his, never was and probably never will be. However, he was good in this. He wasn’t funny, but he was good. The movie is carried on the backs of Seth Rogen and Writer/Director Judd Apatow’s great script. This is kind of the last in a trilogy of Apatow’s with “The 40-Year-Old Virgin” and “Knocked Up” kicking it off. Even though they don’t have the same characters (which could be confusing since they all star the same people except the lead) they’re a linear stream of conscientiousness for the road of life. Although “Virgin” was about a 40-year-old, it dealt with a subject that represented early adulthood. “Knocked Up” was about that pivotal moment in some lives that changes you for the rest of it. And “Funny People” is about the mortality that awaits all of us and how we deal with it. This one is probably the most serious of the three and ironically the least funny. That’s not to say that there aren’t some great scenes and hilarious lines. The one-hit-wonder, Jonah Hill, is there to provide most of that in the movie. The problem with the film is the problem that Apatow has with all his films, they’re too damn long. There is always a part in the last act of his movies that just feels like it could be either cut completely or trimmed by about 20 minutes. In Apatow’s defense, it’s really hard to make a comedy that’s over 2 and a half hours long still entertaining but I would say that in most cases, no comedy should ever try. The good news with this is that it’s not a comedy…not really. I thought that it did a good job of mixing the funny and the sad, but never once feeling like it was forced. I think that probably comes from having a cast that has done this kind of movie so many times over. It also may come from Apatow himself. We’ve known for a while that he is a gifted writer that makes funny movies for adults that both men and women can enjoy together, but he’s now also starting to really show his chops in the director’s chair. This is probably his most visually impressive movies to date, which might have something to do with the story being so visceral. Of course Apatow does get a little annoying at times by allowing so many cameos in his movies, which now comes across as him just showing off how many famous people he can put in his films. Just like the plot of the story, there’s good news and bad news with “Funny People.” Good News: It’s an amusing comedy that’s not afraid to show you a dark and dramatic look at decisions that come from people who are facing death. Bad News: It could’ve done that in a funnier, more dramatic and shorter way. The one problem with a dramedy is that it’s really hard to do well. It never commits to either being a comedy or a drama so the scenes that venture in either direction are either not as funny as they could be or not as dramatic as their suppose to be taken. That seems to be the problem with this. I wanted to love this movie since I saw the trailer. It stars John Krasinski (The Office) and Maya Rudolph (SNL) as a couple who are about to have a baby who travel to different cities trying to figure out where they want to live after finding out their only living parents are moving to Belgium. It’s written by David Eggers and his wife Vendela Vida. They’re both very accomplished novelists who basically used their own lives to create this story, and although many parts are fictional, I wouldn’t be surprised to find out that most of it is true. It’s directed by Sam Mendes who is an amazing director who’s done “American Beauty,” “Jarhead,” “Road to Perdition,” and “Revolutionary Road.” He does a wonderful job guiding his characters through complex scenes of humor and tragedy, just like he did in other films. But it just never seemed to grip me the way his movies did in the past. But what I did like was the concept behind the film. Krasinski and Rudolph see lots of friends and family in all these cities and through that they see lots of different styles of families that are out there. Some of these are hilarious and some are downright depressing. All of them are championed by an amazing cast of actors that range from Allison Janney, Jim Gaffigan, Maggie Gyllenhaal, Jeff Daniels and Catherine O’Hara. Besides realizing the different ways they don’t want to raise a family they also see the different problems that having a family can create. I thought that was really touching to see. And while experiencing this, they begin to work out their own issues as well. Again, it’s a really great concept. Did it translate as well as it should have – probably not. I can’t even really say where it lacked. There are some belly laughs, Krasinski delivers another excellent performance and the film feels soft and inviting. However I never knew how to interpret most of the scenes. I was confused on what the goal of the film was. I wasn’t really shaken by any of the drama and I wasn’t dying from most of the jokes. I just kind of sat there and enjoyed watching the journey these two were taking. And judging by the types of characters Krasinski and Rudolph played…I imagine that’s all they would want from me in return. Remember the movie “The Village” by M. Knight Shamyalan? Were you one of those people who hated that movie because you went into it thinking it would be really scary and when you weren’t scared in the slightest you were just pissed at the movie and thought it sucked? Did you ever go back and watch it again and realize that it’s actually a really good drama and not a thriller at all? Well it is. It was a victim of dumpy advertising. 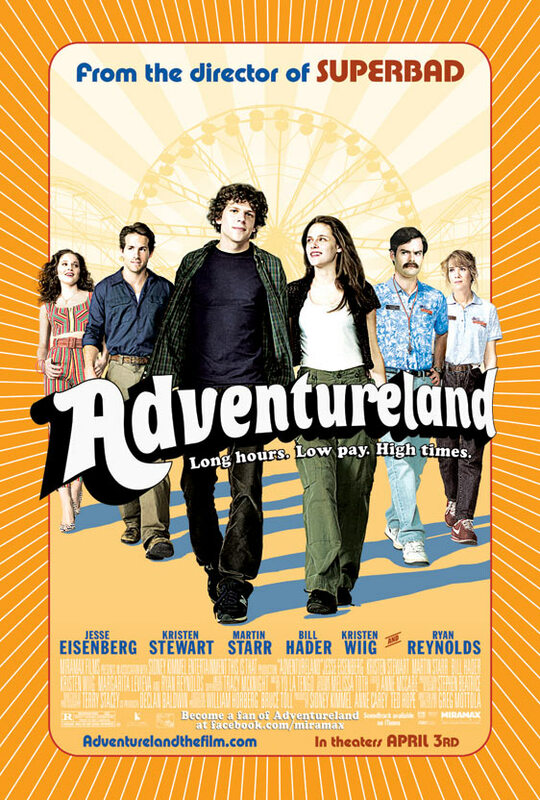 Exhibit B in the case against crap advertising: “Adventureland.” All the advertising for this movie made it seem like a very funny comedy about a horrible summer job. It’s about a summer job alright, but not a comedy. This is a film that pumps in the same vein as “Juno” or “Little Miss Sunshine.” It’s a drama that just happens to have some funny scenes. What I really enjoyed about this movie was the nostalgia. Granted the film takes place in 1987, when I was only 7, but it makes you remember fondly that one summer job you had that you hated at the time but now realize it was the best summer of your life. For me it was when I was a tour guide at a cave called Indian Echo Caverns. It also was a great period piece that subtly captured the culture clash going on in the mid-80s of the rich, the poor and the nouveau riche. Greg Mottola (“Superbad”) wrote and directed this as a semi-autobiography and you can tell. Newcomer, Jesse Eisenberg stars in it as an identifiable character, but not a super likable one at times. Kristen Stewart (Bella for all you “Twilight” nerds) is in this to prove once again that she is either a terrible normal acttress or a terrific actress with a crippling twitch. SNL stars Bill Hader and Kristen Wiig tagteam as great comic relief but the comedic star is a performance by Matt Bush. You may not know him yet, but he’s in the AT&T commercials where he fights with his mom over old rollover minutes. He was fantastic in the movie and I have a feeling we’ll see a lot of him in the future. But again I warn you not to see this looking for a laugh-a-minute romp, but instead a pleasant, warm emotion as you think back to a snapshot of your own horrible summer job that lead to the best summer of your life. Oscar Watch! Director Danny Boyle is quickly becoming one of my favorites. He’s directed “Trainspotting” and “28 Days Later,” which ARE two of my favorites. However he released “Sunshine” which was also very underated and extremely good. All three are intense horror movies of either drugs, zombies or the sun. They all sound rediculous, but end up being amazingly realistic and terrorfying. This time, Boyle decided to lend his aggressive film making to a drama…and throughly succeeded! Apparently in India, “Who Wants to be a Millionaire?” is still going strong as a very popular game show. When a kid, who grew up as a poor slumdog ends up on the show, he’s investigated for cheating since he knows all the answers. That’s where the story begins. We find out that every single question he’s asked on the show is related to either a funny or terrible anticdote from his life. We end up with a touching life portrait/love story that is framed beautifully with this game show. It ends up being a feel-good movie of sorts but not without its fair-share of drama. If you’re looking for recognizable faces or famous actors in this, you won’t find them. It was shot entirely with Indian actors (yes there are subtitles some of the time) and entirely in India. One thing is for sure, Danny Boyle didn’t do anything for the tourism board of India. He makes it appear to be one horrible country!